"With a bolt of lightning on my kicks . . .The court is SIZZLING. My sweat is DRIZZLING. Stop all that quivering. Cuz tonight I’m delivering," announces dread-locked, 12-year old Josh Bell. He and his twin brother Jordan are awesome on the court. But Josh has more than basketball in his blood, he's got mad beats, too, that tell his family's story in verse, in this fast and furious middle grade novel of family and brotherhood from Kwame Alexander. * "This novel in verse is rich in character and relationships. . . . Poet Alexander deftly reveals the power of the format to pack an emotional punch." * "Alexander fully captures Josh's athletic finesse and coming-of-age angst in a mix of free verse and hip-hop poetry that will have broad appeal. . . . This will inspire budding players and poets alike." * "The poems dodge and weave with the speed of a point guard driving for the basket, mixing basketball action with vocabulary-themed poems, newspaper clippings, and Josh's sincere first-person accounts that swing from moments of swagger-worth triumph to profound pain." * "Alexander has crafted a story that vibrates with energy and heat and begs to be read aloud. A slam dunk." "Concrete poems that simulate on-court action, the novel's organization into "four quarters" (plus "warm-up" and "overtime") and a smattering of their father's 10 rules of basketball--as applicable to life as they are to the game--will draw in less avid readers, and the fully-fleshed characters and Josh's spellbinding wordplay will keep all readers riveted to find out if the brothers can mend the breach in their once iron-clad bond"
"An accomplished author and poet, Alexander eloquently mashes up concrete poetry, hip-hop, a love of jazz, and a thriving family bond. The effect is poetry in motion." 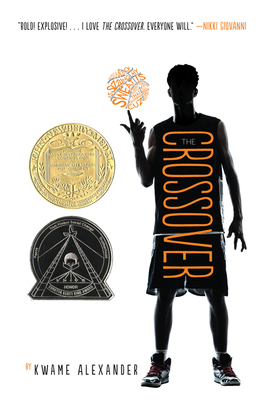 "The Crossover is destined to reach—and touch—readers who never gave basketball or poetry a second thought until now. It’s tough, muscular writing about a tender, unguarded heart." "[Alexander]'s at the top of his poetic game in this taut, complex tale of the crossover from brash, vulnerable boy to young adult." "Since poet Alexander has the swagger and cool confidence of a star player and the finesse of a perfectly in-control ball-handler, wordplay and alliteration roll out like hip-hop lyrics, and the use of the concrete forms and playful font changes keep things dynamic." "Kwame Alexander’s sizzling, heartfelt story-in-verse gives readers that rich sense of SWISH! we feel when a basketball drops perfectly through a net. Quick timing, snazzy cadence, a wealth of energy and deep affection for sports, family and life in general – it’s all here, in these gripping scenes." "Bold! Explosive! Yet still gently poetic. I love The Crossover. Everyone will." "Kwame Alexander's cadenced basketball novel is a gem of poise and grace. His players come alive with the precision and control of an orchestrated musical composition. The poetry of the telling rings through to the heart. The Crossover crosses over as a gift to all ages."